Hi there, I am Tricia. I am so excited to be working with NEO Parent, discussing a few of my favorite things. The best thing in my life is my family. I met my husband while working at the same company. Once we were married and I became pregnant, we decided that I would stay home and raise our family. Our daughter was born, and I knew we had made the right decision for us. I made all her baby food, doted on her every need and just enjoyed thoroughly the ability to just sit and look at her, what an amazing job I had. Soon, it was time for baby #2, another little girl, such joy. When my oldest daughter was 3, we found out she had a rare genetic disorder. Much of the follow years were guided by that discovery. Doctor appointments, therapy, therapy and more therapy. She endured quite a lot, especially for her age. Actually, it affected the whole family. We decided to go to Disney World, to reward her for all the hard work she had been doing. This is when my love for Disney reemerged. My child, with all these fears and anxieties was at peace. 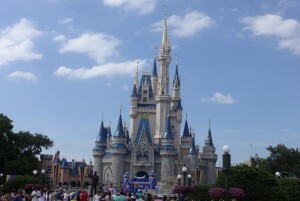 She looked around in amazement… she stared at Cinderella’s Castle, pointed and smiled. She saw Tigger and Pooh (her first love) from a distance, and was completely delighted. This was a child we didn’t see. This was a child, without a care in the world. And Disney World became our home away from home. Now, I had always loved Disney. I had even been a Cast Member (employee of Disney) back in the day. I took that love for Disney and decided to help others travel to Disney World successfully. That may sound funny, what could go wrong, you’re going to the place “Where dreams come true.” And yet, if you don’t know the ins and outs, your ‘dream’ could feel like a nightmare. There is so much to know, and it’s my job to know it. Why should you spend hours researching, learning, comparing details, when that’s my job. I make it easy. You tell me what you want, and I do everything in my power to make it happen. What a great job I have. And, I get to be at home, with my two daughters every day, making ‘Magic’ happen for them. So here’s where you can help me. I have made a list of topics I want to blog about… but I’d also like to know what you want to read about?? You tell me, and I’ll blog about it. Thanks… and I look forward to Building Memories together.